Let's see... this is now the 7th multi-day tournament I've played in with the Golfweek Amateur Tour (including the three-day National Championship). In 5 of the previous 6 events, I've shot myself out of contention on the first day. I was bound and determined to not let that happen this time around... especially seeing as I was playing with the points leaders because I was in the top 4 heading into this tournament. I shot myself out of contention on the first day again. I don't know why I continue to play so poorly during these mutli-day events, but it's becoming a habit now... and a habit that is progressively becoming more annoying as it continues. As with other major reviews... I'm not going to do a hole-by-hole recap. Instead, I'm going to break it down into highlights and lowlights. This saves me the trouble of remembering exactly how many times throughout the 2 days I sucked... and saves you the trouble of reading about how many times throughout the 2 days I sucked. One thing I wanted to make note of is the fact that, at the last minute, our tees were changed. In the previous rounds played there last year, we had always played from the blue tees (6489 yards). On Friday afternoon, when pairings were posted, it was switched and we were now playing the white tees (5867 yards). From a scoring standpoint, this would usually only help me out... but from a competitive standpoint, it hurt because that brought a lot of the 'short but consistent' players into things. In a 24 player field, having a length advantage was something that I was counting on a little bit... but, with the change, I knew that brought every player from the field into contention. Anyway... it's all below for you to review as you wish. I arrived on Saturday full of hope. I was to the course more than 2 hours early. I spent a good 40 minutes on the range getting things 'worked out' and then spent another 30 minutes on the putting green. In between, I spent some time relaxing and chatting with some of my fellow competitors. By the time we were set to tee off... I was ready to go. I was in group 13A, which meant I opened with back-to-back par 5 holes. By 1pm... the first tee shot was in the air and we were off. - There wasn't a whole lot to pick from as far as highlights are concerned, but there were a few things that stood out. On #18, I hit a near perfect 7 iron from the tee that settled about 18 feet behind the hole. Unfortunately, this began a series of putts that I would leave short throughout the tournament, so I wasn't able to convert the birdie, but I did leave myself a tap-in par. - On #5, which is a downhill par 4, I hit a laser of a drive that finished about 2 yards from the front of the green. My eagle attempt from off the green ran past the hole, but I was able to make the 7 footer coming back for my first (and only) birdie of the tournament. - For my final highlight... my tee shot on #7 was an absolute bomb. After missing a simple 4 footer for par on the previous hole, I was a bit agitated and took it out on the ball. It took off like a rocket from the tee and ended up 305 yards from where it began. Unfortunately, I still found a way to bogey the hole with an ugly three-putt, but... the tee shot was by far my best of the weekend. - Things started out ugly for me as I pulled my opening tee shot on the 13th hole, failed to execute a hook around a tree and ultimately ended up with an opening double bogey after a series of mistakes. - On #16, I hit a pretty poor 4 iron from the tee and then hit an equally poor (fat) 4 iron from the fairway which found a downhill lie in the bunker to the left of the green. It took 2 swings to get the ball out of that bunker and another from the rough just to find the green. This all led to a triple bogey on the most difficult hole on the course. - I tried to play smart on #2, so I hit a 4 iron from the tee. It started out perfect and then caught a little bit of a breeze that pushed it slightly to the right. If I had hit it just 4 feet longer, it would have been fine. Instead, it caught the bunker. It took me 2 swings to get it out from there as my 7 iron hit the lip and came back in... so I blasted out with a wedge instead. All this led to a double bogey on one of the easier holes on the course. - Things were pretty good from there until the 10th tee. I had a few ups and downs, but for the most part... I was happy with how I was playing. On the final 3 holes (#10, #11 and #12)... I made mistake after mistake after mistake. A decent tee shot on #10 put me in good position. I slightly tugged a 5 iron and then pitched on... but a three-putt from 16 feet led to a double. I pulled my tee shot on #11, hacked out, hit a poor 8 iron and then blasted out of a greenside bunker and couldn't salvage bogey from 16 feet, so I settled for another double. On #12, which was my final hole, I tugged my tee shot, hit a tree trying to punch out, finally did get the ball out, put it on to 17 feet and took 2 putts from there to close with a third consecutive triple. So... things began poorly for me in the opening stretch of holes as I played the first 5 holes in +8 (including a triple and 2 doubles). In the middle part of my round, I really started to get things moving in the right direction as I played the next 8 holes in +5 (including a birdie and 2 pars). The real problem was at the end of my round. I played holes 8 through 12 in double - bogey - double - double - double to finish +9 over my final 5 holes of my round. Going into the round, I pretty much knew that I needed to 'survive' 13 through 17 and I needed to play pretty solid on 18 through 8. I was up in the air about the last 4 holes (9 through 12) because they're not overly difficult... but there is plenty of trouble to find. Unfortunately, I made the much more difficult than they actually were and that killed my round. I shot a 93 with no penalties... and the leader was at 81. Going into the round, my goal was to be right around 86. I was just about on track to do that until my struggles at the end of the round. I knew that I had no shot going into round 2 but I was still hopeful that I could turn things around and post something really good to move myself up the standings and pick up as many points as possible. As has been the case with these multi-day tournaments, the second day began with much less anticipation. I still wanted to post a good score so I could pick up as many points as possible, but... it was still going to be a fairly meaningless round. I began this round on the 16th tee and I was determined to get off to a much better start than the day before. - As mentioned, I wanted to get off to a better start. My goal was to play 16, 17 and 18 in +2, if possible. I ended up doing just that. After a poor tee shot to start, I salvaged a bogey on the 16th. I killed my drive on the 17th, but then left my wedge just short. i was unable to get up & down from just in front of the green, so settled for a bogey there before making par on the 18th. - I managed to make par on the 4th and 6th holes... but what really made my front nine nice was closing it out with pars on the 8th and 9th holes. On #8, I hit a wedge to the front of the green and then just missed a birdie from 27 feet, tapping in for par. On #9, I hit a decent drive and a fairly poor 8 iron, but still found the green in regulation on one of the more difficult holes we play all year. From 60 feet, I hit a nice little putt to about 2 feet and tapped in for another par to end the front side with a 43. - The way to play this course is to survive the back and score on the front... especially the first 5 holes of the front. I failed to do that... miserably. I made bogey on 1 and 2... double on 3... par on 4... and then an ugly triple on 5. That meant I played the easiest holes on the course in +7. There was no way that was going to be a good thing. - As with Round 1... things really began to fall apart on the back. On #10, I decided to bump a driver into the fairway... only to watch it run through the fairway and into the hazard. I had a play at the ball, but instead of being smart and playing it back out to the right and into the fairway, I tried a hero shot that resulted in the ball going down into the hazard and a penalty stroke. Ultimately, I made triple there. - At #11, I popped up a 3 wood and then decided to be smart and lay up with a 7 iron. That left me a full 7 iron to the green, which I wiped right and into a greenside trap. I blasted out from there and sunk a 7 footer for bogey, but... the damage had been done. - The next 2 holes pretty much ruined my round. On the 12th, my drive went right and ended up next to a bush just right of the fairway. I hacked a 6 iron into the fairway, and then flubbed a wedge before hitting a decent wedge to about 13 feet. I failed to make the bogey putt and settled for double. On the 13th, I blew my tee shot way right and never found it. My provisional was killed, but even from there, I made a mess of the hole and ended up with a triple. Sometimes, I feel like rounds are better than they are. In this round, I knew from my 4th hole on that it was going to be a rough round. I never managed to get anything going and struggled, mightily, to keep my mind in it. Once I made a mess of the 5th hole, I was just hanging on and trying to make it through the round. It just seemed like one of those rounds that I knew were going to be a problem and I couldn't find a way to stop bad things from happening. At the end of the 2 days, I finished 19th out of 24 players in C Flight, marking the second major this season in which I've finished 19th. It wasn't a good tournament for me, and it certainly wasn't what I was expecting heading into it since I had been playing fairly well. After this tournament, I spoke to my wife and we decided to take a weekend trip down to Kiawah Island for the Southern Regional Tournament which will be played on the Osprey Point and Ocean Courses at Kiawah. Although I'm only eligible for 80% of half of the allowable points (maximum of 360 points)... I'm eligible to win the trophy, money and free entry into the National Championship in October. I'll be leaving the clubs in the living room for at least 9 days... and then the week before Kiawah, I'll spend some time on my short game. I'm excited about the trip to Kiawah and I'm counting down the days. Definitely looking forward to playing the Ocean Course! Nearly 23 years... that's how long I've been playing this game. I have no idea on the number of rounds I've played in that time. I know it's not as many as others who are lucky enough to play multiple times each week... but I also know that it's a high enough number that I can't even guess. In all those years, I've been playing competitive golf in some form or another, for most of them. I started playing on my high school golf team. I believe that in the 3 seasons I played with that team, we won a single match. None of us were very good... and our 'coach' was a guy who was just there for the free golf. We were never instructed... just given balls and tee times and told to have fun. I believe that's what led me to my love for the game because I never felt pressure... I was just having fun. Well... after high school, I got away from the game for a few years before returning and immediately playing in a club that played a pretty heavy tournament schedule. I did that for 2 seasons before it became too expensive. I then switched my focus to county tournaments and club championship play for awhile. I then got into another club that played tournaments and match play. I did that for another 2 seasons and decided it wasn't the right mix for me. When we moved to the Charlotte area, I found the Golfweek Amateur Golf Tour. I knew I wanted to play, but I waited until 2015 to join. I played every tournament but maybe 2 or 3 and I knew I was 'home'. On Sunday night, I was texting with some friends from the club and mentioned how I hadn't won a single tournament in all the years I'd been playing. I've come close... and on one occasion, I even placed first... but because I was in a verification period, my win didn't count. Still... 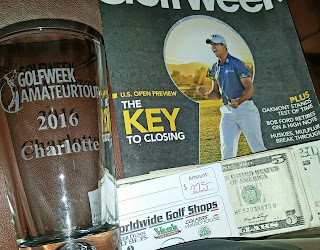 I hadn't won an event... but I was feeling good and predicted that I just may turn it around the next day at River Run Country Club. I was right. After almost 23 years and a countless number of tournaments and other events played... I FINALLY earned my first victory on June 13, 2016! The details of my round are below. One of the nice things about this day was that the tour director had us playing from a really short set of tees that measured just about 6000 yards total. I knew this would allow me to keep the ball in play and hopefully eliminate big scores from my scorecard. On this tee, I elected to hit driver since I had been hitting it pretty well on the range. I didn't realize there was trouble I could reach... but it didn't matter because my tee shot was directly on my target line. This left me about 110 yards to the hole. I hit a wedge that finished a little off target and then chipped to about 5 feet. Unfortunately, I couldn't convert that par attempt and opened with a bogey. The toughest hole on the course didn't really have any reason why it should have been labeled as such. I made it tougher than necessary when I pulled my tee shot and watched it hook into oblivion. I hit a provisional that finished through the end of the fairway and I ended up playing that one as we never found my original ball. From about 115 yards, I hit a pitching wedge that landed on the left side of the green. I needed 2 putts from 25 feet and I posted a double bogey. The hole was actually playing about 155 yards and I knew a full 7 iron would be too much, so I elected to try and fade the ball a bit to take some distance off. The shot came off exactly as I saw it, but my shot landed 2 feet shy of being perfect. Instead, the ball sat at the front edge of the green. I hit a nice little chip that left me a tap in par. From the tee here, my front foot slipped a little bit but it didn't hurt me as my ball found the left side of the fairway. With a carry of about 200 yards being required from this spot, I elected to lay it out to the right with a 7 iron. This left me a 91 yard shot up a hill to the pin tucked way back. I hit a really good wedge shot from there which finished on the fringe. I putted from there to about 4 feet and I was able to convert the putt from there for another par. I came to a hole which took driver out of my hands. I hit a hybrid from this tee that found the left rough. My ball was in a tough position on an slope which had the ball above my feet and on an incline. I hit a pretty decent wedge from there that found the green. From 66 feet, I hit a beautiful putt that nearly went in but finished 2 feet away, leaving another easy tap-in for par. I hit a decent drive here up the left side, but it finished in the rough and behind a tree. I didn't really have much of a shot, so I decided to hit a 5 iron up the right side. I made good contact and the grass closed the face of my club a bit, so I got a nice little draw that ran out into the middle of the fairway and left me about 60 yards to the hole. I hit a good wedge shot to about 13 feet but missed the birdie attempt by an inch or so. It ran past the hole by about 3 feet and I made that coming back for a 4th straight par. I hit a very solid 4 iron from this tee that stayed out right a bit and found the rough. Unfortunately, it also found a downhill lie. I proceeded to make a huge mess of this hole as my 9 iron from that position ended up in a bunker. It then took me 3 strokes to get it out from there. Ultimately, I ended up with a snowman that was reduced (via club rules) to a triple bogey and my momentum was halted in a hurry. This was a short little par 3 with no real trouble. The pin was in the center of the green and there was plenty of room to miss left. I aimed left with a pitching wedge and rode a breeze back towards the middle of the green. I was left with a 27 footer. One of my playing competitors had a similar line and I watched his ball turn a lot at the hole. With that read, I was able to make a good stroke and watched as the ball tracked and dropped for my only birdie of the day. At the end of the round, I found out that this birdie earned me a $265 skin payout! This should have been one of the easier holes on the course, but I messed it up pretty bad. When I started my backswing, a bug flew between the ball and my feet. It distracted me and I should have stopped my swing, but I didn't. It resulted in a top-pull with my hybrid that rolled into the left rough. I didn't have much of a chance to do anything, so I tried to punch a 5 iron back into the fairway. Instead, I duffed it forward about 90 yards. I then laid back with a 9 iron, leaving me about 110 yards. My wedge from that position was right of the green. I chipped up to about 7 feet... couldn't make the putt from there and tapped in for another triple. My birdie was sandwiched by triple bogeys and I knew I needed to settle down a bit to keep myself in it. Yes... that is correct. A 432 yard par 5 hole. From the tee... I was thinking eagle the entire way, but even though it was a short hole, it wasn't necessarily an easy hole. I made it more difficult than necessary by hitting a straight shot when I needed a cut and I ended up in some pine straw up the left side. My only real option was to hit a 4 iron up into the fairway, which I was able to do successfully. That left me with an uphill shot of about 60 yards. I thought I had executed it to perfection, but my ball had run over the green into the fringe. I putted from that position and ran it over the left edge of the cup, but about 5 feet by. I was able to make the putt from there for a par. A bombed 4 iron from the tee here put me in great position in the fairway and left me about 135 yards to the flag. I hit a pretty good 8 iron from there to about 33 feet. I left that woefully short, but from 15 feet, my par putt was true and I walked away with another par. The flag was way up and the hole was only playing about 125 yards, so I went back to a pitching wedge. I hit a really, really poor shot and watched as it faded towards the tree overhanging the right side of the green. The ball settled into the rough to the right of the green and I was short sided. After watching a playing competitor hit a shot from just a little further away, I had a pretty good idea of how I wanted to play this shot. I pitched the ball into the fringe and watched as it rolled up just to the left of the cup, leaving me a tap in from 10 inches for a 3rd straight par. I was hoping to close out the front side with another par, but on the tee I elected to hit a 4 iron for safety and I caught it a little fat. It only managed to run out to about 170 yards and left me around 180 yards to the hole. My 5 iron was struck well but faded off at the end and hit a tree pretty hard. This kicked my ball into a bunker about 25 yards short of the hole. From there, I hit a very poor sand shot that barely escaped and rolled onto the green about 38 feet from the hole. I never really gave it a chance, but left myself an uphill 4 footer which I was able to convert for a simple bogey. ** NOTE - If I could have gone back and replayed the 3rd and 5th holes, I would have felt much better about the front side. That said, I was pretty happy with my club score of 42. I had 5 holes to go and knew if I could just find a way to play bogey golf, I may have a shot at placing in the money again. There didn't appear to be much trouble while standing on the tee, and I had been hitting my driver pretty solidly... so I decided to get aggressive. I hit a beautiful little shot that left me in the middle of the fairway with only about 80 yards to go. I was at a perfect sand wedge distance and hit it right where I wanted. The ball finished 7 feet to the right of the hole. Unfortunately, I wasn't able to roll the birdie putt in as it ran over the right edge of the cup, but it left me a tap in par to begin the last few holes of my round. I hit a good tee shot here with my driver, but didn't quite get the distance I was hoping for, plus it ended up just off the fairway in the left rough. I was left with a pitching wedge, which I thought I nailed, but the ball ended up just over the back of the green. My chip from there got caught in the sticky fringe and stayed there, so I putted from that position to about 2 feet and tapped that in for a bogey. Not great considering I had played 2 pretty good shots to get to where I was. Another par 5 that looks (from the card) like it should have been reachable, but with trouble down the left side by the green... that wasn't the case. I hit a solid drive that tailed off at the end and finished in the right rough. Once you reached the top of the hill, the hole ran down and towards the water to the left of the green. I tried to just pitch a wedge into the fairway at the top of the hill but caught it heavy and it settled in the primary cut of rough much further back than I wanted. Instead of being smart... I tried to get a 4 iron to the hole from there and pulled it into the hazard. From there, things got ugly in a hurry... luckily, the triple bogey max rule kicked in and I just picked up and took my snowman on this hole. I honestly, at that point, believed I had just thrown away any and all hope of winning the tournament. Reeling from the previous hole, I wasn't exactly thinking. I wanted to get the ball somewhere up in the fairway and leave myself about 150 or so to the hole. Instead of being smart and hitting my 4 iron or hybrid, I pulled out my driver and decided to just take an 'easy swing'. This resulted in a pulled, hooking drive. I got the kick of the day there, though, as the ball was spit out back into the middle of the fairway. It left me 194 yards to the hole, and there was a hazard crossing in front of the green, but I figured if I had any shot at winning at this point, I was going to need to get the ball up there near the green and make no worse than a bogey. Again, my stupid muscles kicked in and I hit a hybrid instead of laying back short of the creek. I managed to pull it off, however, and cleared the creek and finished a little long and left. I hit a pitch from there to about 15 feet. I wanted to be aggressive with the putt so I really went at the hole and I blew it 10 feet past. Continuing with the theme of the day, I managed to pull myself out of trouble there and made that putt coming back for a bogey. Last hole... last shot to make something happen. At that point, I knew I had a 2 stroke lead on one of the guys in our group and I figured, if nothing else, if I beat him... I'd make it into the money. Well... he hit a great shot onto the green. I then proceeded to blow my 8 iron well right of the green. When I got up to the ball, it was in a halfway decent lie in the rough, but the green was heavily sloped. I played a little pitch towards the back of the green and let it run slowly down to about 5 feet below the hole. As had been the case all day, I then made that putt and salvaged a par. ** NOTE - I stood on the 10th tee telling myself I needed to play +5 over the last 5 holes and, in the end, I did just that. I made a number of key putts today, but the last 2 putts of the day really saved me. When we got to the scoring area, there was only 1 group posted and none of them were even close. As cards came in, my 86 continued to hold up and when then final card was posted, I won by 2 strokes. It's the first time I've ever won a tournament, so... the feeling was great. I got my little trophy... a $225 Edwin Watts gift card and an additional $265 cash for my birdie on #4 which made the victory all the much sweeter. There are approximately 12 days until the next tournament, a two-day major the last weekend in June. Between now and then, I'll bask in the knowledge that I finally earned a victory... I'll get back to work at some point in the middle of next week... and then when that tournament comes, I'll go in with a game plan hoping to go back-to-back and possibly get my National Championship entry paid for by way of a major win!